Happy Columbus Day! I never get this day off so it’s hard for me to remember until everyone is posting about having the day off. This is one of my favorite fall outfits because it’s so easy to wear yet the leopard scarf and oxblood accessories add a unique touch to it. I’ve been wearing this handbag nonstop. It’s so spacious and is so comfortable. I love a bag that can be taken from day to night and this one is definitely it! It’s also a great price point (under $70) and is great quality! I think it comes in one other color, but I really love this one. What do you guys think of the new site?! I hope it’s a lot easier to navigate, faster and of course mobile-friendly. Lindsay from White Oak Creative did such a great job and I’m really thankful for her. She made my vision a reality and I know that sounds corny but it’s so true! I had so many ideas for this little site and she did such an amazing job. I highly recommend her! My emails will now be going out every Thursday instead of everyday so you’ll have to check back the site daily for new posts! Loving the new site! I never get this day off either, so I get so jelly when people are posting about having the day off! Thank you! And ugh… wish we had it off! lol! Right?!! It’s insane. And it’s SO SO good! The new site looks great! I have that same scarf from last year and wear it all the time- it pulls any look together so easily! Thank you! Yeah I got it last year and still wear it all of the time! Isn’t Lindsay the best?! Your new site looks amazing! New site looks so pretty! Congrats on the facelift! 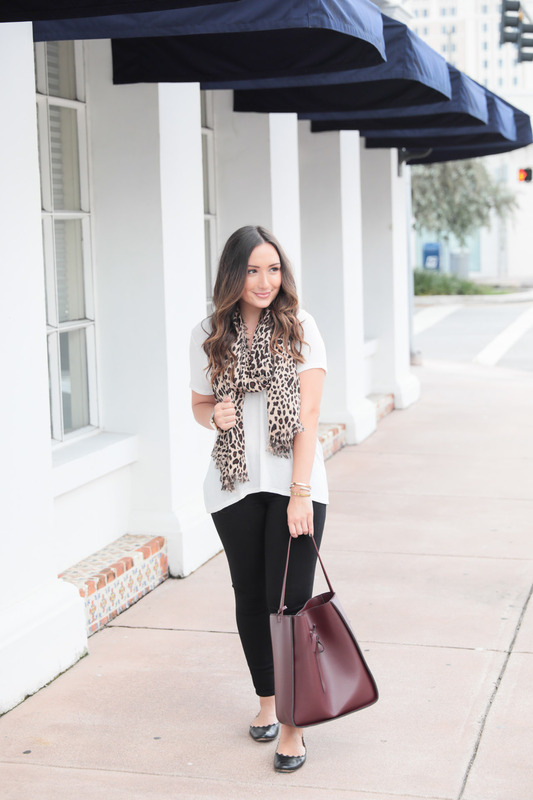 Love that bag–a great way of incorporating that hue into my Fall wardrobe. I’m gonna need this bag, STAT!! It is so gorgeous and the price is SO reasonable!! That bag is currently in my cart! I am SO obsessed with oxblood for fall! Love this laidback look! You are gorgeous!! What a cute look! I love that scarf! such a great fall outfit!!!! 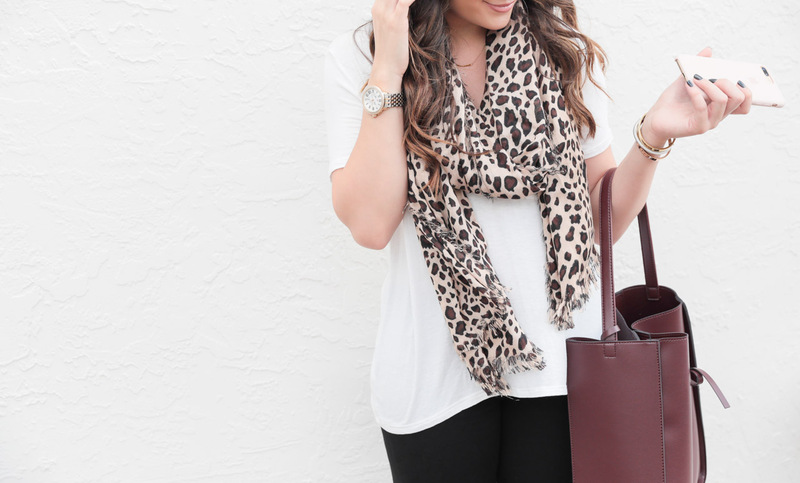 Love the leopard scarf! Loving this leopard scarf! Perfect fall look!